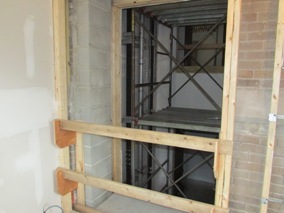 The elevator under construction in the new vestibule entrance. 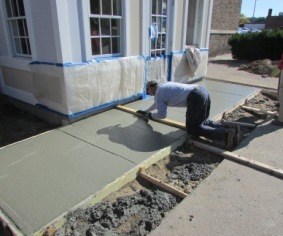 Contractor put the finishing touch on newly-poured concrete at the new vestibule entrance. 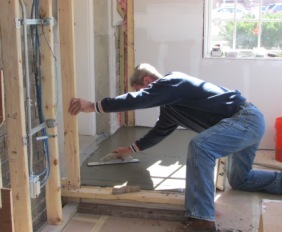 Contractor smooths the new step extension pad at the present entrance inside the new vestibule. Construction of the elevator in the AFGS Franco-American Heritage Center is complete and has passed inspection by the State of Rhode Island. The $300,000 project was funded by a $150,000 matching grant from the Rhode Island Historical Preservation and Heritage Commission. The elevator allows access to the four levels of the 19,000 square foot building. The campaign to raise the $150,000 match began last year.